We learned a couple of weeks ago about an intrepid underwater explorer who had discovered some interesting stuff beneath the radioactive waves of Fallout 4. Could there be more, we wondered? As Reddit user Lavonicus discovered, the answer is yes—quite a lot more, in fact. Lavonicus spent more than 30 hours over the past three weekends exploring the Fallout 4 seabed, an adventure he documented in a collection of more than 100 images that he posted to Imgur. Most of them are conventional screen shots, but there are a few maps as well, documenting the location of particularly important finds, like an unoccupied suit of power armor, or the "Meow Boat." 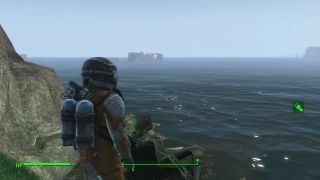 Lavonicus said his travels cover close to 100 percent of Fallout 4's underwater realm, but promised to resume his deep-diving in DLC follow-ups, which he predicted will contain proper aquatic locations. "In the past for Fallout 4 you have shown concept art of underwater content and through mods we have found out there is a Harpoon gun that was supposed to be in the game," he wrote. "It may not be in the game currently, but I know we'll have underwater content eventually in DLC. When that time comes, I'll spend my time combing through the water content of the DLC until I find it." Well done, Lavon. You are truly the Steve Zissou of the post-nuclear world.